Shrinking down to fun size has historically been an entertaining idea in the imaginations of many. Whether it is ‘Ant-Man’ in the pages of comics or ‘Honey, I Shrunk the Kids’ in the theatrics of movies, “getting small” isn’t exactly a new concept. In the latest film ‘Downsizing’, Director Alexander Payne attempts to add a satirical spin on the miniature world with people living like royalty while also saving their carbon footprints, but the result is an awkwardly muddled comedy that squashes any chances it may have had with making a big impact. Paul Safranek (Matt Damon) is a struggling Occupational Therapist for Omaha Steaks (subtle ‘Nebraska’ plug, hmm?) that wants nothing more than to move out of his inherited house and make his wife Audrey’s (Kristen Wiig) dream of owning a grander manor come true. After their failed mortgage application reveals their true financial situation, however, they both are convinced by two shrunken class alumni to adopt the alternative lifestyle of scaling down with the promise of luxury. But once the procedure has been done, things don’t exactly go to plan and Paul finds himself taking a dramatically different path than he had originally hoped for. 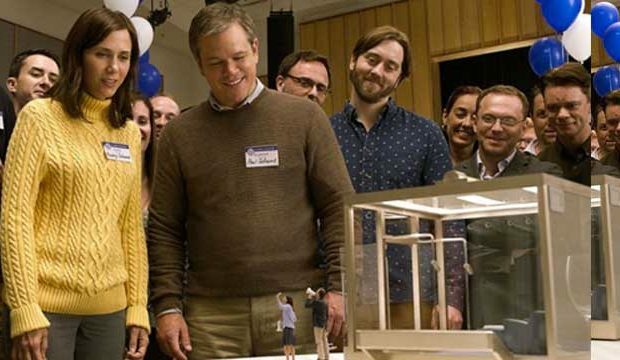 ‘Downsizing’ feels misguided and overextended. Despite a few amusing moments and capable cast, the tone is all-over-the-place – as if the writers were on completely different pages. The funny scenes are often grimacing and the serious scenes come across as neurotic. It’s quite a shame that the love interest (and best element of the film), Ngoc Lan Tran (Hong Chau), squanders her gift on such disorderly context. What starts as an exploration of science and possibility, transforms into an apocalyptic muss of drudging proportions. Frustrating to say the least, ‘Downsizing‘ overpromises and under delivers; it’s an ambitious effort with a bizarre execution. The beginning feels miles apart from the end, and even though the visual effects obliterate anything ever portrayed as tiny on screen foregoing, this sci-fi adventure quickly gets swept away into a dismal and unfortunate flop of ideals. ‘Downsizing‘ is a mediate story of ‘what if’ that ultimately fails to achieve the comical glory of its intentions. You can call it a missed opportunity maybe, but ‘Downsizing‘ is a clever thought that was regrettably drawn-out into full feature length. Matt Damon Shrinking For ‘Downsizing’!!! This entry was posted on Thursday, December 21st, 2017 at 1:21 pm	and is filed under Film, News. You can follow any responses to this entry through the RSS 2.0 feed. You can skip to the end and leave a response. Pinging is currently not allowed. « Film Review: ‘Jumanji: Welcome to the Jungle’! !